Webpage created: March 09, 2017. In the Devonport Borough Council minutes is an entry dated February 16th 1893 stating that Devonport's Technical Instruction Committee had taken a 5 years lease on number 38 George Street, at an annual rental of £65, for the purpose of creating a technical school. A subsequent minute, dated August 28th 1893, stated 'that arrangements have been made for classes to be formed there on the 11th of September and for instruction to commence on the 18th of September'. The students were chiefly engaged in the trades and industries of the Borough and by October 1893 there were 425 students in the register. 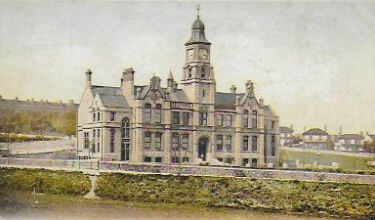 From a postcard entitled "Devonport Technical School". 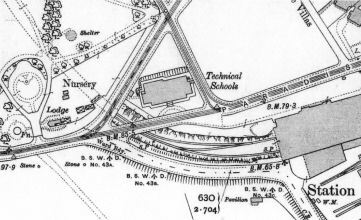 On September 26th 1895 it was minuted that: 'It be resolved on the recommendation of the Technical Instruction Committee that application be made to the Local Government Board for their sanction to a loan of the sum of £8,000 for the erection and furnishing of the new school buildings on the site acquired from the War Department.' Unfortunately the lowest tender received for the construction of the building, which was to have science and art departments, was £13,268 and the request for permission to borrow had to be increased to £14,000. The Local Government Board sanctioned this loan on December 9th 1896. The foundation stone was laid on Queen Victoria's Diamond Jubilee Day, June 22nd 1897, by the Mayor of Devonport, Mr W J Waycott, JP. The architect was Mr Henry John Snell and the builder was Mr Thomas May, of Cobourg Street, Plymouth. An inscription on the building reads: 'The erection of this school building was commenced in the year 1897 in commemoration of the 60 years glorious reign of Her Majesty Queen Victoria and on completion, was on the 25th Day of July 1899, duly inaugurated and dedicated to the public use and benefit by the Right Worshipful Mayor W Hornbrook Esquire in the presence of and with the assistant of Sir William H White, KCB, LLB, Dr.Sce, FRS.' Sir William was a former apprentice in the Royal Dockyard who rose to become the Director of Naval Construction. He was given the Freedom of the Borough of Devonport on that opening day. The research for this webpage has been undertaken by Debbie Watson, Archivist at the Plymouth & West Devon Record Office.